Combine brown onion, chilli, fresh coriander, parsley, preserved lemon, lemon juice, garlic, paprika, cumin, ground coriander, turmeric and olive oil in the bowl of a food processor and pulse until combined but mixture still has some texture. Season with salt and pepper. Transfer chermoula to a large shallow dish. Add chicken and toss to coat. Place in the fridge, covered, for at least 30 minutes to marinate (overnight is better). Preheat a chargrill over high heat. Cook chicken for 4 minutes each side or until chicken is cooked through (reduce heat to medium once chicken is sizzling so the marinade doesn’t burn). Combine lime juice, sour cream and red onion in a small jug. Season with salt and pepper. Toast buns until golden. 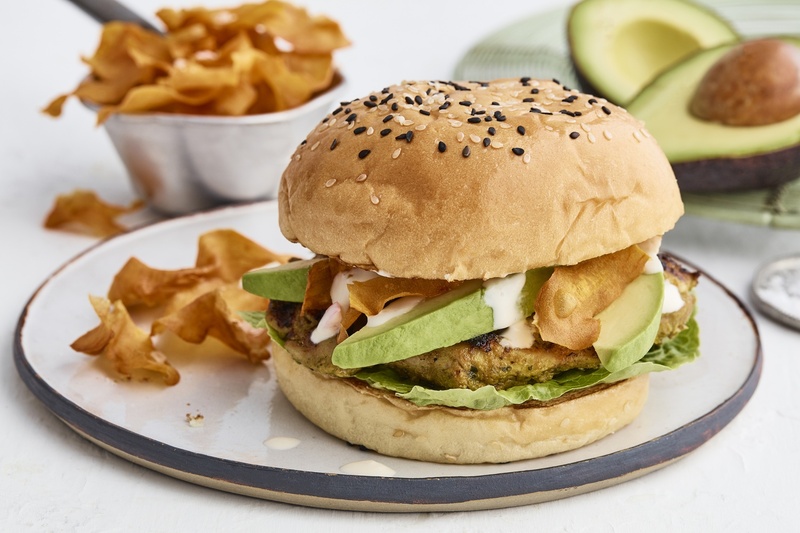 Top bun bases with lettuce, chicken, avocado, sweet potato crisps and a drizzle of lime sour cream dressing. Replace bun tops to serve.